Guests at Los Cabos’ newest boutique hotel, Mar del Cabo, can request a Rum Flip, Hot Chai Tea Toddy or Whiskey Skin as part of its new Nightcap Turndown offering. Forget chocolate squares and warm chocolate chip cookies, the latest luxury turndown is a DIY nightcap. 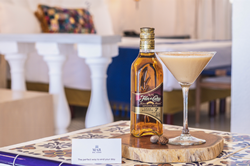 Guests at Los Cabos’ newest boutique hotel, Mar del Cabo, can request a Rum Flip, Hot Chai Tea Toddy or Whiskey Skin as part of its new Nightcap Turndown offering. All the ingredients, necessary equipment and a recipe card with the instructions to make one’s own will be delivered on request. Whether getting over Jet Lag or being in a new place, a soothing nightcap calms nerves and relaxes the body for a full night’s sleep. If you can’t make it to Mexico this year to try out the creative turndown, Mar del Cabo shares its recipe for a Rum Flip. Add rum, Demerara and egg into a shaker. Shake for at least one minute. Open shaker and add ice. Shake the drink in the tin for an additional minute (at least). Strain the cocktail into a chilled glass using a strainer. Using a grater, grate fresh nutmeg over the top of the drink. For more information and to book, call 1.844.314.2352, email reservations@mardelcabo.com or visit https://mardelcabo.com/.